It was a cold morning in Uyuni, a town in the southwest of Bolivia at nearly 4,000 meters above sea level. We were staying at Tonito Hotel, a comfortable hotel with recently added upgraded rooms. The hotel is said to have the only WiFi in town and its restaurant is known to have the best pizza and breakfast. Excited for our day tour of the Uyuni Salt Flats and ready for this breakfast worth talking about, I arrived in the restaurant wearing dark wash skinny jeans and a bright yellow shirt layered with a sweater and insulated jacket. Upon sitting down, the conversation at our table turned to what we were wearing to the salt flats. I looked at my jeans when someone offered to let me borrow their colorful pants they bought in Morocco. After asking what was wrong with my jeans, the answer was bright colors! The Uyuni Salt Flats are the biggest salt flats in the world covering over 15,000 square kilometers. Salt flats are the result of a body of water usually in deserts that evaporated, leaving salt behind. Because of the seemingly endless white landscape that the salt creates, the main attraction is to take creative optical illusion type photos. 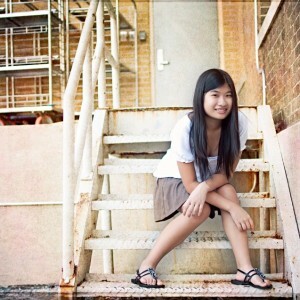 And wearing bright colors makes the photos pop and look exciting. After changing into the colorful pants, our tour guide, driver and cook arrived in a 4×4 vehicle. 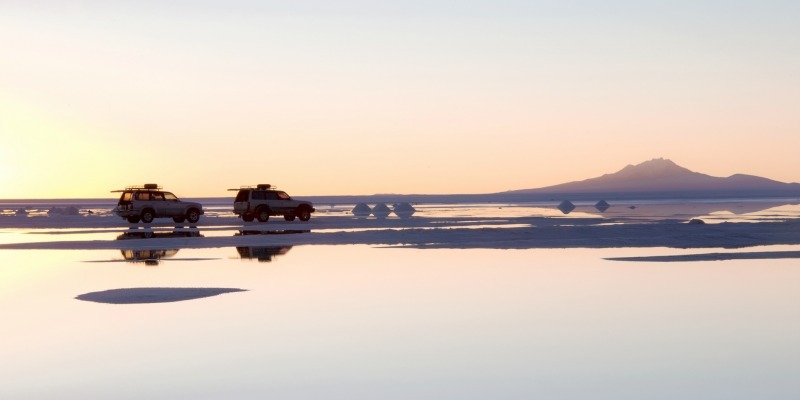 Touring the salt flats in a 4×4 is necessary since Uyuni is a town virtually in the middle of nowhere. It mainly exists as a place for tourists to stay while visiting the nearby salt flats. So the roads are rugged. Before arriving at the salt flats, a day tour of the Uyuni Salt Flats includes a visit to the train cemetery, an abandoned collection of rusted trains. Our guide told us rumors that the infamous Butch Cassidy and Sundance Kid robbed one of the trains. And it’s worth a visit to take a few photos. If you’re up for it, you are free to stand on top of the train or just climb around it. Take a seat and swing on one of the swings attached to the trains for a short break before heading back to the 4×4. A short ride in the 4×4 will take you to your next stop. Not the salt flats yet, but a small town called Colchani where its residents process salt. One of the workers will show you how the salt is processed and then packaged. You’ll have the opportunity to purchase a bag of your very own Bolivian salt or browse around tables of souvenirs of alpaca or llama wool products. Don’t forget to purchase the ultimate souvenir chullo, the name for a woolen hat worn by the locals and almost all tourists alike. 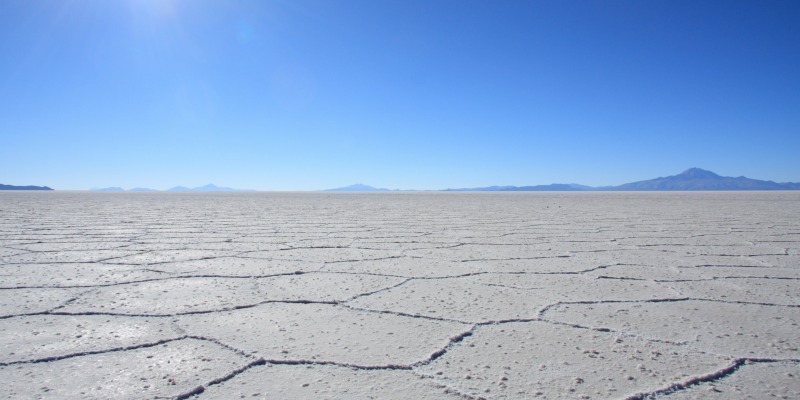 Once again, head into the 4×4 and the next stop is at the beginning of the salt flats. Salt piled into perfect pyramids are scattered throughout the area. These are not natural occurrences, but the hard work of workers who collect the salt to process. It is advisable to leave the salt piles alone and refrain from taking pictures of the workers. Respect the workers as they are just going through their everyday lives. There have been cases of angry workers when tourists interfere. By now, you should notice the intensity of the sun. Because you are in a high altitude area, the sun is more intense. And the sun reflecting on the surroundings of white salt around the salt flats add to the intensity. Please remember to wear sunglasses to protect your eyes! Now would be the time to adjust to seeing the white because that’s what you’ll see for the next hour before arriving at Isla Incahuasi or Fish Island in the heart of the salt flats. This island seems out of place, as it’s filled with cactus. You can take a short hike up the hill on the island to get a view of the salt flats. Just note with the high altitude, you may be out of breath quickly. No matter how fit you are, remember to take it slowly and stop whenever you need to catch your breath. Included in most day tours of the Uyuni Salt Flats is lunch. After your hike, your cook will have prepared a delicious meal. Ours included salad, chicken, pasta, bread rolls, and some fruit and hot tea or coffee for dessert. Relax for a moment on the island before going back to the 4×4 for your drive back to Uyuni. But before arriving back in Uyuni, it’s picture time- the main attraction! This is your chance to be creative. Take advantage of the white landscape to create some fun photos. Examples include making objects that are normally very small, bigger than yourself or making yourself look bigger than your traveling companions. 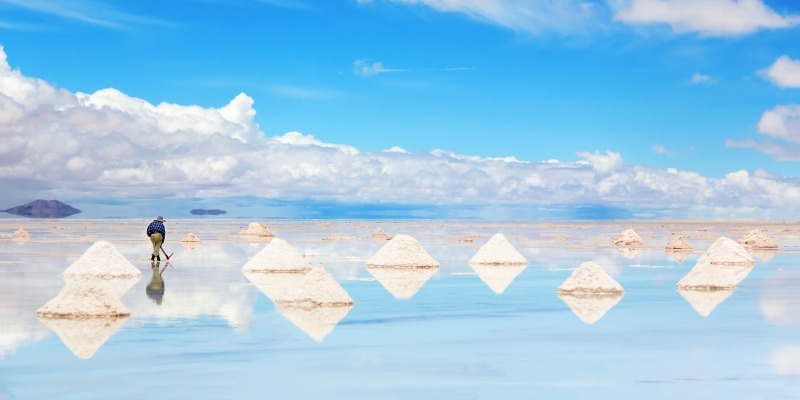 If you are visiting during the rainy season from November to March, the salt flats are covered in a thin layer of water. This makes the landscape look like a giant mirror, giving you an opportunity for more creative photos. Your guide will give you plenty of time to create these photos and there’s still one last stop to top off this full day. That is, a salt hotel. The one I visited is not in use anymore but is still open for visitors to see their furniture made entirely of salt. 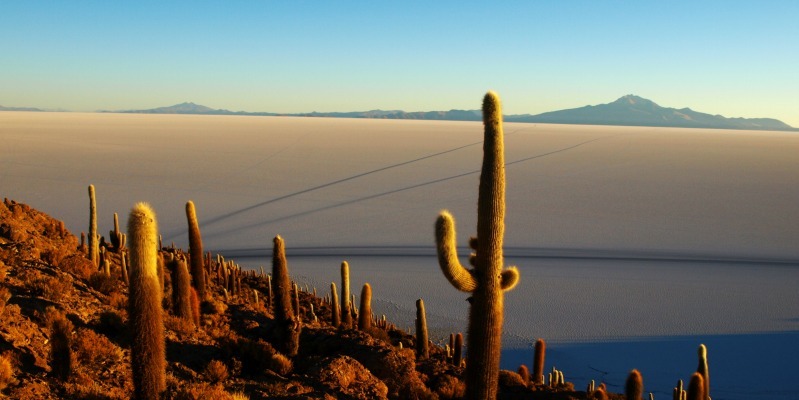 Before embarking on your own Uyuni salt flats tour, note that Uyuni Bolivia’s weather is mainly cold throughout the year. Even though it’s cold, be sure to bring sunglasses and sunblock due to the intensity of the sun at high altitudes. Also, to cope with the high altitude, drink plenty of water and remember to take it easy. And most importantly, don’t forget to wear your bright colors! 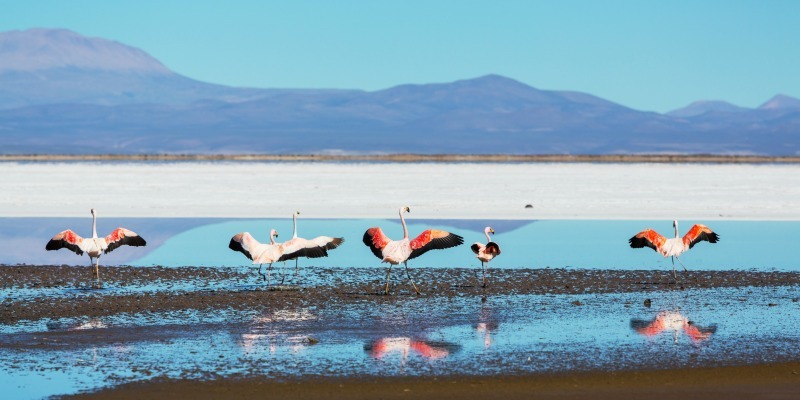 If you enjoyed this memorable day tour of the Uyuni Salt Flats, discover other South America Destinations here! Social Media Manager, Teen Entrepreneur, World Traveler.